The bear hunting dogs vary in breed and type from the AKC recognized hounds to the primitive breed known as the “Karelian Bear Dog” of Finland that has an ancestral history, which began over 2,000 years ago. But the basic hunting breeds are different into hounds, water dogs, and terriers. And all have been bred over the years to assist their owners in bringing home food for the family. Each breed of hunting dog has a particular set of skills, such as dogs that allow them to hunt a specific type of game. Stamina is not the primary skill even though it is highly important but the ability to pick up a scent and stay with it, in addition, to see exceptionally well, all plays a heavy part in making a good hunting dog. The hounds are the most popular dogs for the stamina they exhibit to hunt bear. The hounds are of the sight or scent groups, or the scent and sight skills together. The Irish Wolfhound hunts big game and the Norwegian Elkhound hunts elk and moose, but the Rhodesian Ridgeback, also known as the African Lion Hound, hunts large game, such as bear, deer, elk, and moose. Also used for bear hunting dogs are the Plott hounds and the Walker hounds. Bear trapping and the use of hunting dogs has become controversial in certain areas, as expected with the viewpoints of present day animal protectionists. Trappers and hunters view this form of political control by such groups as a personal attack on the historical and traditional way of life, with unnecessary chipping away at their individual rights. They argue that this method is a safe and effective way of killing bears, rather than letting the bears become large in number and threaten society and human populations. The Maine bill, Legislative Document 1635, bans recreational bear trapping in Maine while allowing bears to be caught for scientific research, animal damage control or public safety, even though the traps are the same as what hunters use. 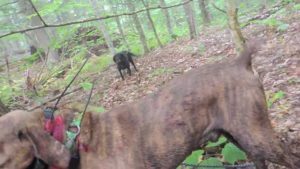 The ban would remove three types of bear hunting bait, hounds, or traps all methods used by hunters alone. Some popular bear hunting areas are Alaska, Colorado, Maine, Minnesota, Montana, New Mexico, and North Carolina that offers professional guides and outfitters for the black bear, brown bear, and the grizzly bear. Licenses are needed, and some states require tags. A five-day hunt usually begins around $1,250 on up, for you and your bear hunting dogs. Colorado alone boasts an $180 million annual business for hunting, which is being compromised by wildlife management.